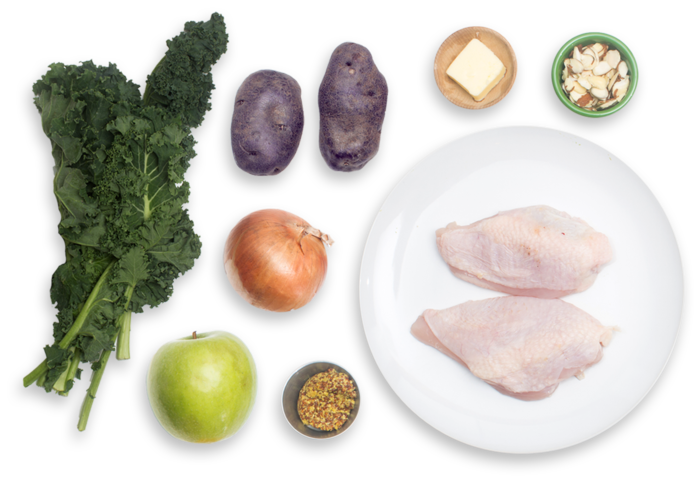 In this recipe, we’re serving crispy-skinned chicken over a hearty sauté of purple potatoes, Granny Smith apple and kale. 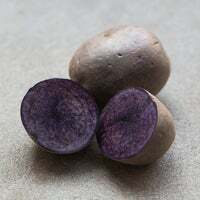 Purple potatoes (popular throughout South America) add gorgeous color and deeper flavor to the savory-sweet sauté, which gets a mild kick from whole grain mustard. 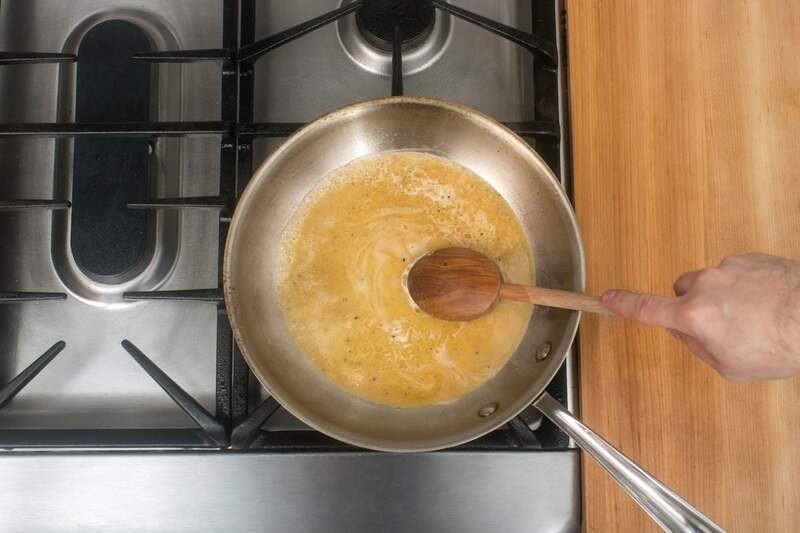 To round out our elegant meal, we’re topping it all off with a simple, delicious pan sauce. Wash and dry the fresh produce. 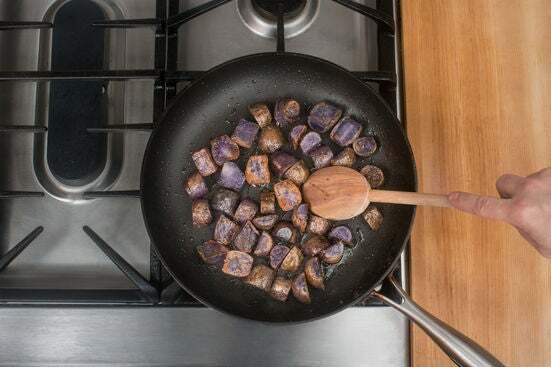 Medium dice the potatoes. Peel and medium dice the onion. 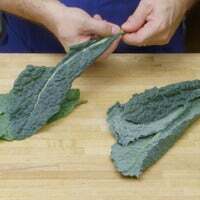 Remove and discard the kale stems; roughly chop the leaves. Peel, core and medium dice the apple. In a medium pan (nonstick, if you have one), heat 2 teaspoons of olive oil on medium-high until hot. 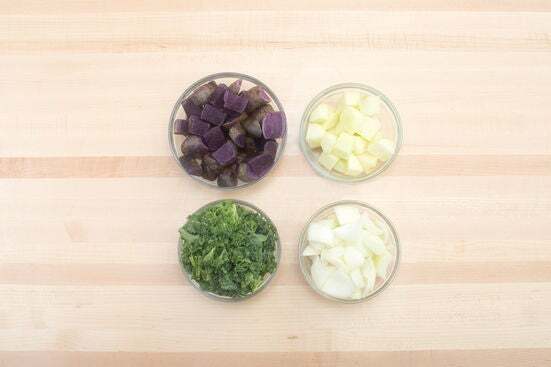 Add the potatoes; season with salt and pepper. Cook, stirring occasionally, 8 to 10 minutes, or until browned and slightly softened. 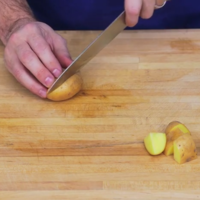 Add the onion to the pan of potatoes; season with salt and pepper. Cook, stirring occasionally, 3 to 5 minutes, or until softened. 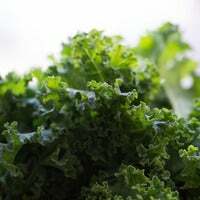 Add the kale, apple and 2 tablespoons of water; season with salt and pepper. Cook, stirring occasionally, 2 to 4 minutes, or until the kale has wilted. 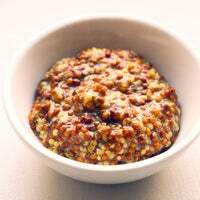 Add the almonds, mustard and 2 tablespoons of water; cook, stirring frequently, 30 seconds to 1 minute, or until thoroughly combined. Remove from heat and season with salt and pepper to taste. While the vegetables cook, pat the chicken dry with paper towels; season with salt and pepper on both sides. 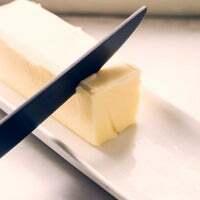 In a separate medium pan, heat 2 teaspoons of olive oil on medium-high until hot. 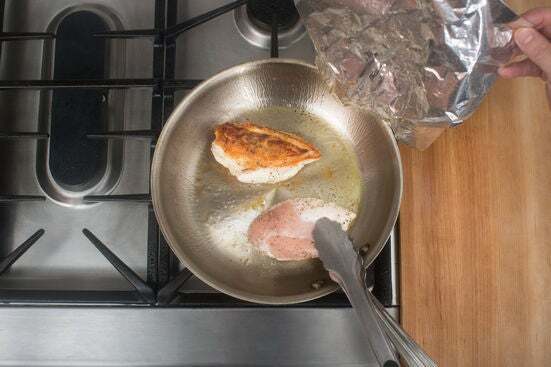 Add the seasoned chicken, skin sides down; cook, loosely covering the pan with aluminum foil, 4 to 6 minutes per side, or until browned and cooked through. Transfer to a plate, leaving any browned bits (or fond) in the pan. 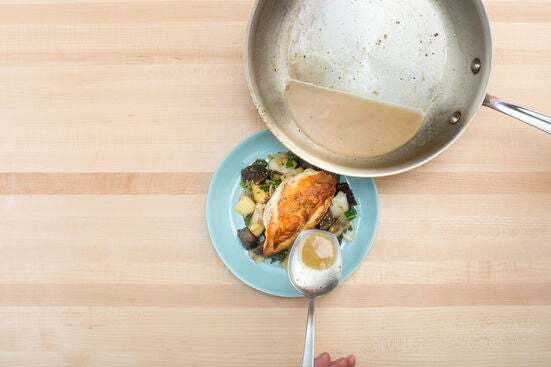 Set the cooked chicken aside in a warm place. Add the butter and ¼ cup of water to the pan of reserved fond; season with salt and pepper. 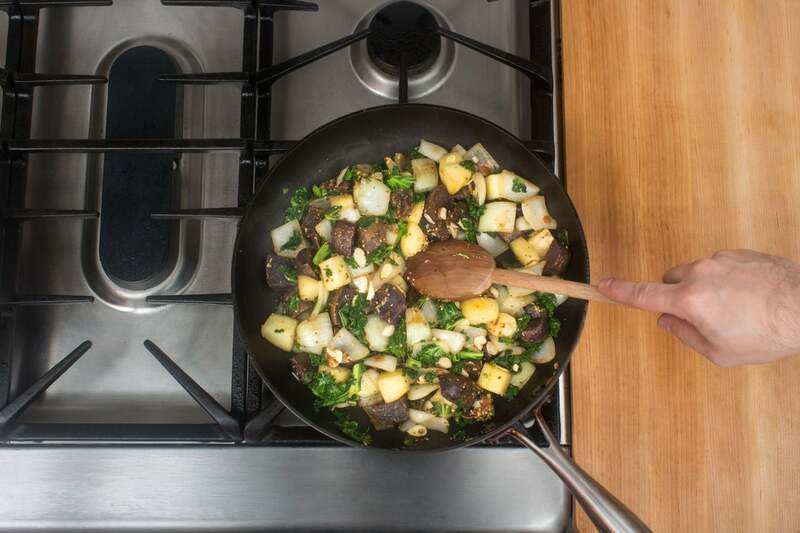 Cook on medium, scraping up any fond from the bottom of the pan, 1 to 2 minutes, or until thoroughly combined and slightly thickened. Remove from heat and season with salt and pepper to taste. 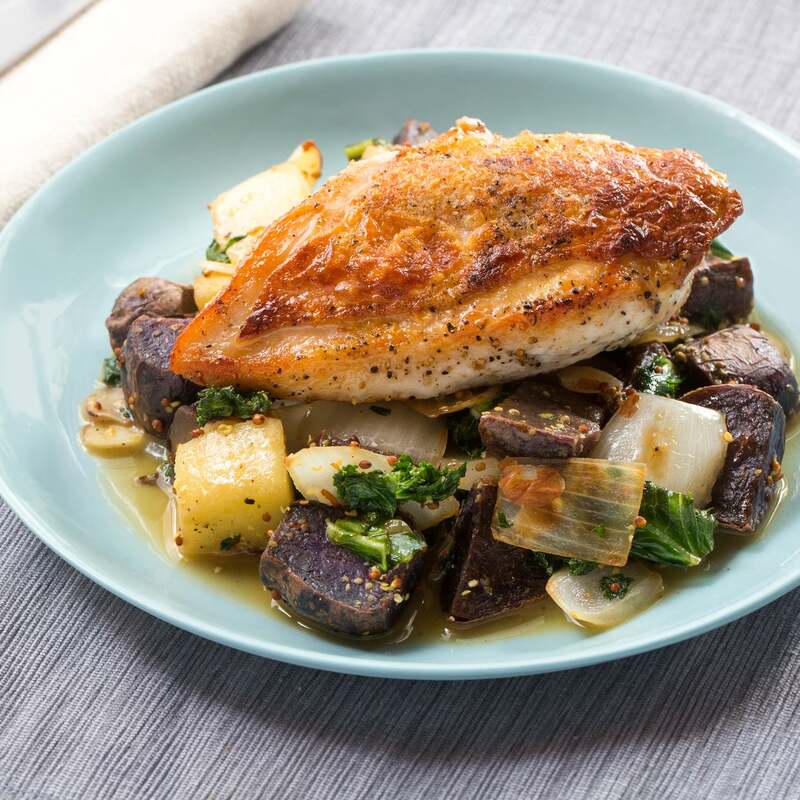 Divide the finished vegetables and cooked chicken between 2 plates. Top with a few spoonfuls of the pan sauce. Enjoy!